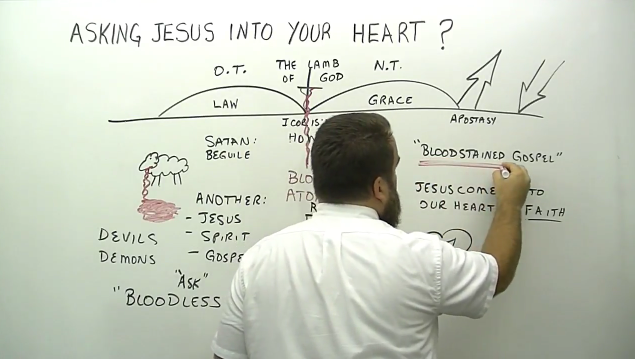 Robert Breaker (42) explains how WRONG it is to 'ask Jesus into your heart'. So many people THINK they are saved and that they know the right gospel, but in reality this isn't the case. Watch this video and GET SAVED in case you're one of those who have always believed in the WRONG gospel! Have You Trusted The Blood? 12 Neither by the blood of goats and calves: but by his own blood entered he in once unto the holy place, and obtained eternal redemption for us. 14 How much more shall the blood of Christ which through the eternal Spirit offered himself without fault to God, purge your conscience from dead works, to serve the living God? 15 And for this cause is he the Mediator of the new Testament, that through death which was for the redemption of the transgressions that were in the former Testament, they which were called, might receive the promise of eternal inheritance. 16 For where a Testament is, there must be the death of him that made the Testament. 17 For the Testament is confirmed when men are dead: for it is yet of no force as long as he that made it, is alive. 18 Wherefore, neither was the first ordained without blood. 20 Saying, This is the blood of the Testament, which God hath appointed unto you. 22 And almost all things are by the Law purged with blood, and without shedding of blood is no remission. 23 It was then necessary, that the similitudes of heavenly things should be purified with such things: but the heavenly things themselves are purified with better sacrifices than are these. 26 (For then must he have often suffered since the foundation of the world) but now in the end of the world hath he been made manifest, once to put away sin by the sacrifice of himself. 28 So Christ was once offered to take away the sins of many, and unto them that look for him, shall he appear the second time without sin unto salvation. 24 But I pass not at all, neither is my life dear unto myself, so that I may fulfill my course with joy, and the ministration which I have received of the Lord Jesus, to testify the Gospel of the grace of God. 25 And now behold, I know that henceforth ye all, through whom I have gone preaching the kingdom of God, shall see my face no more. 27 For I have kept nothing back, but have showed you all the counsel of God. 28 Take heed therefore unto yourselves, and to all the flock, whereof the holy Ghost hath made you Overseers to feed the Church of God which he hath purchased with that his own blood. 31 Therefore watch, and remember, that by the space of three years I ceased not to warn everyone, both night and day with tears.